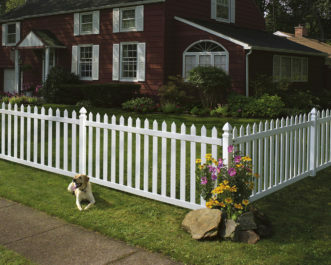 Do you need fencing contractors to install a new fence in your Edwardsville, Illinois yard? If so, Chesley Fence & Deck is the company to call. We have an A+ rating with the Better Business Bureau and decades of experience installing premium fencing, making us one of the top fencing contractors to hire for your installation. And to ensure that you get the most out of your new fencing, our highly trained, experienced, and certified in-house fencing contractors, never subcontractors, will install your fencing according to best practices and in whatever configuration that best suits your needs. So, whether you need a fence to keep your small pets and children in your yard or keep them out of your pool, Chesley Fence & Deck can help. If you would like to hire the fencing contractors who have installed more fencing than any other company in the area, contact Chesley Fence & Deck today. We proudly serve all homeowners residing in Edwardsville, IL and neighboring communities.